A.o.A! 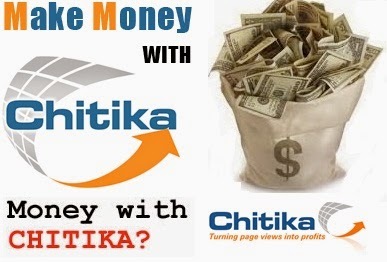 Guys today in this video tutorial I will tell you how you can make money with Chitika which is an ad network like Google Adsense etc.Chitika is also considered as one of the best alternatives of Google Adsense.I have also being using Chitika over this site some time ago.I just wanted to know whether it’s paying or not? But I when I saw my first earning I was shocked that it was more than 100$.It might not be much but considering how little “face time” it gets with my readers, I’m not complaining.And surely, if I took the time to optimize it, I could probably increase my monthly income fairly easily through Chitika.Now I will tell you Guys some advantages of using Chititka Ad network! Chitika is known as the best alternatives of Google Adsense. There is no approval needed for using Chitika on your Blog/Website. The ads are designed very beautifully which leads to more clicks. It delivers ads based on the keywords of your website used to find your website. It is second competitor of Google Adsense. It provides ad units in every size. It’s ads run through Yahoo & Bing network and can be a great way to add extra income as blogger. It works best if you have most of your traffic coming from Search Engines. Additionally, you can make money by referring people to Chitika. Sign Up For Chitika Now! I tried my best to explain you about Chitika advertising network so that you can earn from it easily and should not feel hopeless due to restrictions of Google Adsense.Please share your experience about it in comments.I am waiting eagerly to know about your opinion.Please also share this post with your friends so that they can also earn from it, and please like our FaceBook Page and stay connected to us for learning about more ways to make money online.Remember me in your prayers! Happy Blogging! what is valid click in chitika ? bro plz add your video tutorial coz video is more easy for understanding !! !